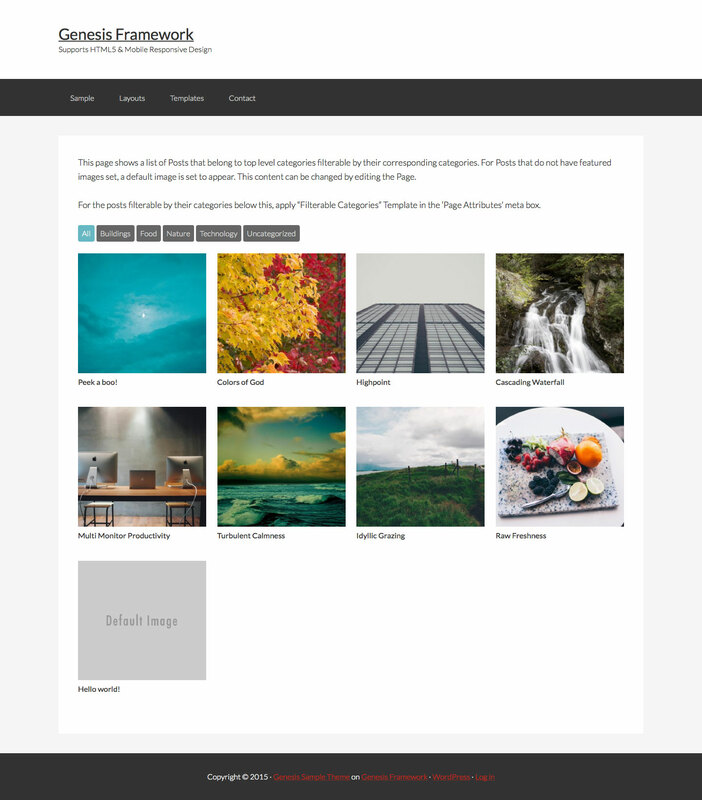 In this tutorial we shall set up a full width Page Template which when applied to a Page automatically displays all the Posts in top level categories in your Genesis powered WordPress site filterable by their corresponding categories. Note that I also shared a Page Template for displaying Posts Grid in Genesis Filterable by Sub Categories of a specific Category. Thanks Sridhar! It’s just what I was looking for. Is it possible to exclude the “uncategorized” filter button? The simplest solution would be to not leave any Post in the default Uncategorized bucket and assign to at least 1 other category. Would this work for you? Yes, it could be a fine solution. Thanks. Hey Sridhar, I was waiting for a tutorial as this but when I implemented the steps as described (on an altitude pro dev site – http://karen.ohanamedia.ca/blog/) I am getting nothing, just white page. I doubled checked the steps. The two .js files are not being loaded. Can you send me WP and FTP logins via https://sridharkatakam.com/contact so I can take a look inside? 1) You have implemented one of my other tutorials for adding full width featured image as the Page title background with Parallax effect. Because of that, all Pages were set to use template_singular-parallax.php. The Blog Page was not using page_filterable-categories.php. I excluded the Blog Page from the template_include filter in functions.php. 2) I uploaded the missing js/jquery.mixitup.min.js and images/default-image.png. 3) I added code in page_filterable-categories.php to show the Parallax background page title section. 1) In functions.php, changed http://pastie.org/pastes/10499218/text to http://pastie.org/pastes/10499216/text. 4) In style.css changed http://pastie.org/pastes/10499221/text to http://pastie.org/pastes/10499223/text. thank you very much for your help, I guess one should be thinking before putting ALL your tutorials together as they may be conflicting. There is one thing that is not working according to plan, the page is now full width and not within a page container like you have it in the tutorial. Fixed by changing http://pastie.org/pastes/10500848/text to http://pastie.org/pastes/10500845/text. Hi Sridhar, i have the same issue mentioned above where the page is white with no content. I assume it’s a conflict with another customisation but i’m not sure how to trace it down. My site is currently offline so i’ve sent you a pm if you would mind having a look. I found the culprit of the conflict it was a duplicate body class used for this tutorial https://sridharkatakam.com/using-masonry-genesis-pinterest-like-layout/ . Changing the body class prefix sk_ fixed the issue. Now it’s working, i do have a couple question. 2. I’m currently using the function below to include the “review” cpt on the masonry archive pages but the cpt’s aren’t displaying on the filterable page. Is they a conditional i could add to this function to include custom post types in the filterable grid? I’ve tried adding the following to the template after the title, but it doesn’t work. Can you offer any guidance as to what i’m doing wrong? This is an awesome tutorial however I can’t seem to get it functioning properly. It seems I was having a bit of an issue due to the fact I also have the full width parallax header section on my pages that uses the template_singular-parallax.php just like isaac. I’ve updated the files stated in your reply to him on my server and made sure my js/jquery.mixitup.min.js, js/mixitup-init.js and images/default-image.png were all there as well (in my child theme) and the update to the style.css. I have added a few blog posts with categories, created my new page and chosen the Filterable Categories template. I save, then view that page on my site and all that is there is the title of the page. So somehow something is not working correctly and not showing me my categories. Is there something else I’m missing? Are you able to help me with this as I was crazy excited to have this implemented on my site. Thank you for all of your great tutorials, including this one! I have one question: Do you know how you could add the additional level of “sorting” that mixitup offers on top of the category filtering? For example: Sorting the results based on a custom field value and/or alphabetically? I don’t know why the filtering is not working on my projects page. It was working last week, and now it’s not. I’ve been troubleshooting it for hours and can’t see a problem, but it must be simple, so I hope you can nail it quickly. However, the site is not yet public so I sent you a htaccess login via your contact form.